My moment of self-awareness came while holding auditions for my campus improv comedy group. As an ice breaker, we went around the room and offered people the chance to introduce themselves, where they were living, and the their most clever Venmo payment to date. A hush fell over the crowd. Nervous freshmen glances ensued. It was early September and not one of the BC freshmen in the circle even knew what Venmo was. Looks of horror appeared on faces of our upperclassmen who could not believe the freshmen’s ignorance, and more looks of horror appeared on the faces of the freshmen who were already thoroughly terrified by the audition process. This was when I realized that, despite using Venmo with everyone I knew at BC, the rest of the world hadn’t really caught on to the idea. Back in 2014, when PayPal acquired Venmo, recent survey data at that time indicated that many people had no use for an app like Venmo. The top reasons people were not interested were because they either did not trust sending money through an app or didn’t see a reason to switch from cash. But unsurprisingly, Venmo did hit its stride with one particular demographic–millennials, the generation obsessed with captioning everything else, so why not payments? By 2016, Venmo was one of the top iPhone apps with the highest portion of millennial users, right behind Yik Yak, but edging out competitors like GroupMe, Tinder, and Vine. In an interview with the CEO of PayPal, executive Daniel Schulman explained that, “the secret sauce of Venmo was turning a transaction into an experience.” In contrast to other options, like PayPal’s own pre-existing mobile payment options, Venmo offers its users a social network to share their payments with the world. Users are not required to publicize their payments, but as the CEO points out, most users do opt into the social aspect of the app. Millennials have witnessed the rise (and fall) of many different social networks over the years which I believe is very indicative to why a payment app might be most accessible to millennials whose daily smartphone interactions are already centered around being social. On Venmo’s website the main call-to-action occupying the homepage is to “Sign Up with Facebook,” suggesting that mobile payments are one very small step away from a potential user’s current habits. But the average person is probably not aware of the fact that PayPal owns Venmo, and it’s entirely possible that PayPal would like to keep things that way. In a talk the CEO gave to undergraduates at NYU, one student even apologized to Schulman, confessing that most of the student was using Venmo instead of PayPal, unseeingly unaware of Venmo’s place in PayPal’s product portfolio. But he explained that this was not something PayPal was too concerned about. Does an end user really care if Instagram is owned by Facebook, or is the right brand name trusted by the right segment the only part that matters? Outside of the millennial segment, usage of Venmo as the preferred mobile wallet solution is actually quite low–probably lower than the average millennial might think. Numbers from the 3rd quarter of 2016 suggest that PayPal’s main mobile app offering remains the most popular mobile wallet at a 49.5% share of survey respondents compared to Venmo whose 7th place total is only about 6.3%, according to Catalyst Consulting Group. Ahead of Venmo are Google Wallet, Apple Pay, Android Pay, and even mobile wallets offered by individual banks. Surveys like this that place PayPal in first place even without Venmo’s user base accounted for only reemphasizes PayPal’s CEO’s findings that a multi-brand approach does not seem to be resulting in cannibalization or harmful marketplace confusion. In fact, the phenomenon of Venmo becoming a verb in the circles of people that use the app regularly just goes to show how the experience of using Venmo is unique enough, with its social offering, to be a brand that’s more than just the sum of its transactions. But competition could be heating up in the mobile wallet/payment space. The recent popularity of mobile payment options at points of sale through Apple Pay and Android Pay could threaten person-to-person operations like Venmo if a company like Apple chose to embrace the experience aspect of owing friends money. Additionally, recognizing Venmo’s social features as a critical jumping-off point in the market, Facebook has also added payments in Messenger to allow friends to easily exchange funds. But with its privacy policies a large part of its history, underlying trust issues about users’ banking information security may play a role in the market’s trust of who is handling their payments. Google, in addition to Android Pay and Google Wallet, is rolling out functionality in Gmail’s Android app that would now allow mobile users to attach money to an email the same way they would attach a Word document. This move is a bit confusing considering users’ ability to do this through Google Wallet already, but with more than one billion monthly active Gmail users, maybe a more centralized and up-front offering is Google’s optimal route for person-to-person payments. I believe what Google has learned is that an all-in-one solution for sending friends money and spending money at the store might not be the right solution for today’s market. have chosen to team up in a collective approach in the form of a new app called Zelle. 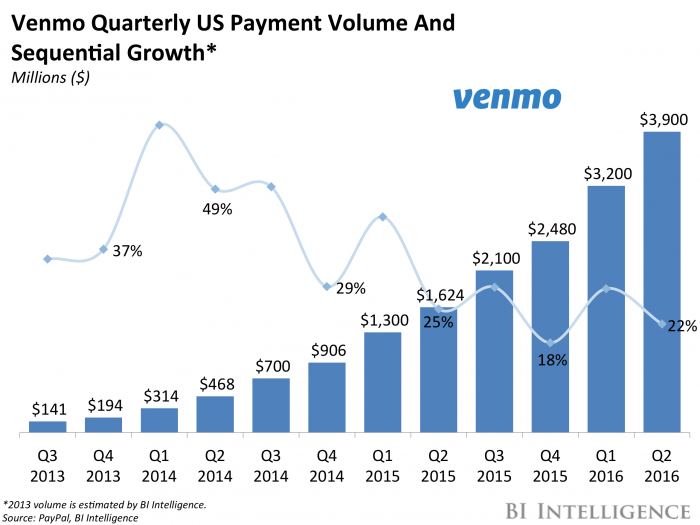 Coming in 2017, 19 different banks, including Bank of America, Citigroup, JPMorgan Chase, and Wells Fargo, are teaming up for a new website and app that will let users send and request money much like Venmo. The sleek, Apple-esque website boasts its main selling features: bank-level security and instant transfers. These features are important because the speed of transactions and the level of security offered are both very contingent on the banks themselves, even in Venmo’s case. Users who trust their bank enough to hold their money might also be expected to trust an app offered directly by their bank. And with Venmo requiring more than a day to cash out into a user’s bank account, instant transfers among participating Zelle banks might be a very appealing feature to those banks’ current customers. With the influence of these top banks and their large customer base, pushing a service like Zelle out to the public might be a winning strategy that can push non-millennials over the edge and into the mobile P2P payment space. Venmo has certainly achieved the honor of being the first person-to-person transaction service that really does offer a unique experience. Suddenly, a simple $3 debt paid to a friend can involve an entire micro-culture of emojis and sarcastic payment descriptions. New users who visit the Venmo website are immediately presented with a live feed of globally-visible payments whizzing by from person to person, which I believe perfectly crystallizes the connectivity Venmo is its offering users. Without even being a bank, Venmo was able to build trust with its users simply by allowing them to personalize a payment with an inside joke that turns a previously routine transaction into a social interaction. Interesting that the greatest reason for a lack of interest in using smartphone for payments stems from people’s unwillingness to store sensitive information on their phone. This finding is certainly in line with my sample size of peers and friends, who, though avid Venmo users, maintain a level of skepticism with respect to having one’s information on their device. Venmo and other banking apps have tried to offset this with finger print password detection, but I still hear of daily grievances with Venmo. Today, when my roommate tried to Venmo a student selling marathon Monday t-shirts, she found that she had paid the wrong person, and was severely disappointed that there was no way to reverse/cancel the payment. As the Venmo-using millenial that I am, I was surprised to read that PayPal’s main mobile app offering is the most popular mobile wallet with Venmo 7th on the list for preferred mobile wallets. The network effects of Venmo are certainly engrained in the millenial demographic, but I think you make a great argument that the company’s platform may not be the future of mobile payments. Along those lines, I am particularly interested to see how long it will take for bitcoin to go mainstream for mobile payments in the U.S. This is a really interesting post – I can’t believe your freshman were unaware of Venmo! Now I’ve been hearing of more and more parents getting Venmo which I always think is kind of funny. I do think there is still a little lack of trust with any of these apps, but that is changing. My roommates and I got our security deposit back from our rental house and split up the very large amount through venmo, which was so much easier than writing out 10 checks. I think that something like Zelle which is backed by banks will do better than a Facebook pay or Apple wallet, which have been around and thought of as inconvenient or too public. I would definitely download Zelle if I knew other people I exchanged money with use it, but right now Venmo is so widely accepted and used that I’m trusting to stick with that. Great post! I am definitely someone who uses Venmo because of the captions you can put with your payments, so this was an interesting read for me. Also, I thought it was funny that I had not even realized that there are so many other sources of mobile wallets — venmo is so prominent on campus that it feels like other payment methods are never really considered. Really interesting post. I am still surprised (yet not really…given how transparent everything has become with millennials) that something as a basic as paying a friend back a few dollars owed has become a social phenomenon. I didn’t know about Zelle prior to reading your post, so I enjoyed learning about that. I would like to know more about the security behind Venmo and if there are any security threats by making payments from customer to customer transparent on a newsfeed. Interesting topic and great title. Really great thorough post. It’s been interesting to see Venmo take off among college students. I confess that I don’t have much of a need for it, but it would certainly have made life much easier in college! I really don’t think I would survive without venmo (sorry for the drama) but it’s true! The amount of frustration I forgo not having to do math for who owes what on a restaurant bill, not having to wait for people to give me cash after I spot them, not having to get a weird amount of quarters instead of dollar bills, etc has made venmo an instrumental part of my life. My dad was sending me money to pay for rent over the summer and he asked if Pop Money (https://www.popmoney.com/) was ok and I was almost offended that he wasn’t going to just venmo me. It’s interesting how students in college have so readily adopted venmo while other age groups have not. I guess when you are older/ younger you are not splitting things as much so there is less need for venmo. What I think is the most interesting about what you said is the social aspect of venmo. Sometimes I find myself scrolling through venmo seeing what people paid each other for and then I stop and think “why am I doing this?” I guess it’s just an interesting/ different aspect that you get to see about other people’s lives. I hate carrying paper money with me, just absolutely hate it. I’m always worried I’ll lose it and I always prefer to put things on my card. That being said, I recently stopped carrying cash because I realized that 99% of the time, the reason why I use cash is to pay back friends for split checks at restaurants……which I now use Venmo for. It’s just one of those tools that is just so simple that I can’t think of what it was like beforehand. Being able to cash out and have the money appear the next day is extraordinary. While the social aspect is of secondary importance to me, I do find myself tailoring my transaction descriptions to my friends, who I know will appreciate it. Curious to see if “Venmo” will be synonymous with Google, where you might be using another search engine, but you’re still just gonna say “Google It” as a the verb of choice! Awesome post. You really dug into the topic & brought out a ton of new perspectives I hadn’t thought of at all. I also had no idea Venmo was under PayPal’s parent company, it’s interesting to see how Venmo really is like a little subset of PayPal pretty much directed at millenials just by adding the social feature. Similar to Christine, I didn’t realize how infrequently Venmo is outside of our generation, especially because I’m one of those kids that’s convinced their parents to make a Venmo account solely for purposes of exchanging money with me. I’m curious to see if one platform will take over the mobile wallet market, or if we’ll continue to use myriad apps. It seems as though people would naturally converge to one platform for network effects, but I’m interested to see whether that will be an app like Facebook that people are already on or if people will be more inclined to use a bank-backed app, or something they deem more trustworthy. Great post and it almost reminds me of how Uber gained its popularity amongst millennials as well. Sometimes looking I forget how difficult it was to split bills or owe people money but now it can happen so quickly. I did not realize how unpopular it still is. Of course there are people who do not trust the app, therefore I wonder if the new app Zelle will be able to grab the older generation who is not sold on Venmo. I do not necessarily use Venmo because of its social network but it is interesting to see the that they company thought about that sort of selling point. Really interesting post. While many of us use venmo, few of us have actually thought deeply about why it’s so popular. Similar to the freshman who auditioned for you, I had a similar experience my freshman year. I had to be convinced by an upperclassmen of the importance of venmo. When I asked my parents about it, the idea of sensitive information on their phones terrified them. Yet, I now can’t live without venmo. To echo the comment of @ghakimeh, I also dislike paper money. Its cumbersome to count it out the right amount at the register. This is all just another side effect of the digital revolution in general. I’ve seen a few articles about about entire countries looking towards cash-less societies. Really curious how this would affect the macroeconomy once mobile payments accelerate to a bigger scale. If the US government doesn’t print as much cash, how will that affect the economy? Will businesses need to adapt to processing larger payments (for friends to venmo each other afterwards)? Great post! It is crazy how Venmo has become such a social phenomenon among the millenials. I love the fun and convenience of Venmo too, I got right after I moved to the US, as it seemed like everyone around me was using it to pay each other for all sorts of activities. I have even went out forgetting my wallet a few times – as long as your friends are around, you can always Venmo them for your food or drinks – all you need is your phone with the Venmo app on it. Like many others, I am also curious to learn about how secure their platform actually is and how the information about personal transactions is encrypted. I recently learned that Apple Pay transactions are actually more secure than regular credit card and bank transactions, since every transaction in Apple Pay has a unique encryption key assigned to it. I wonder if Venmo utilizes the same or similar level of security, given how transparent and social the platform actually is. This is a really interesting post! My parents went through a pretty big issue of someone stealing their identity and using their credit card information so I was really hesitant to start using venmo which made many of my friends pretty angry because they all use it and it made paying me back for things very inconvenient for them. However, I do use it now and it has made life a lot easier. Even though it technically is a form of social media I never really see it as more than just a mode to pay my friends back. It is extremely convenient but I think itll be very hard for them to get it to a point where people regularly scroll through the venmo newsfeed to see what their friends are paying people for.